We were back to Maplewood Bog today for MAPS visit #3. We’d got 20-25 captures on each of our first two visits, and were expecting something similar today, perhaps a handful more as some young start to fledge and move around. Imagine our surprise, then, when our day-end total finished up at 45 captures, more than double what we’d had the previous visit! We had a good number of chickadees caught, including part of one family that I’d noted had been foraging in the trees near the net. On my way to check said net, I’d paused to photograph the adult birds and their youngsters in the tree canopy. Not the best angle, looking up at their bellies, but good enough for the blog. I ran off a couple dozen photos and then moved on to the net, where I found a couple of the fledglings waiting for me. They were returned to the site once they were banded, to be reunited with their family. One of the things that drew my attention to the family group was the constant chirring of the young birds. 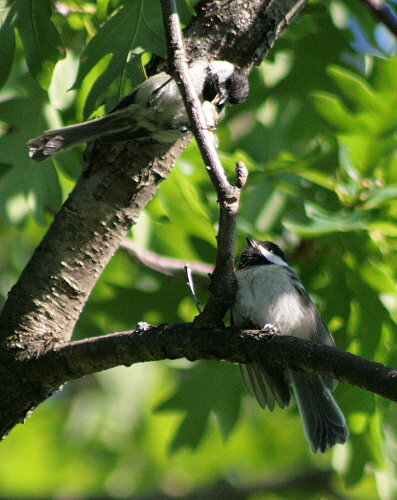 The fledglings will slightly spread and flutter their wings, and chirr at the parents to encourage them to feed them. The noisiest ones are the ones to get fed first, so natural selection has driven them to become quite noisy. I could hear them from 50 meters/yards away, begging at their parents. Since chickadees aren’t very secretive, as birds go, it didn’t take me long to find them. 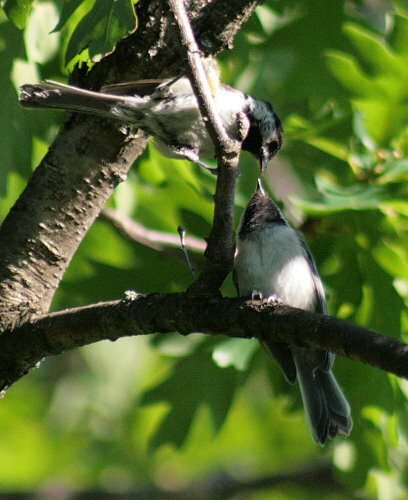 I watched for a bit as the parents foraged through the branches, catching food, preparing it for the young (for instance, pulling a caterpillar out of a cocoon, which is what I think the adult was doing here), and then stuffing it in their maw. Unfortunately, I didn’t think to get a photo of either of the youngsters while I was banding them, which is too bad, they’re irresistibly fluffy little birdlets, with thick yellow “lips” at the corners of their beaks (these turn into a bright yellow mouth, when the bird opens its mouth to beg – another evolutionary tactic to stimulate parents to feed them). 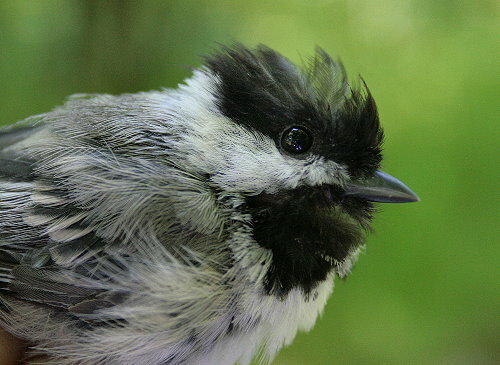 It was interesting to discover that our banding captures weren’t heavily biased toward young birds, as is often the case when numbers spike like that. Two-thirds of the birds we caught were adults, and while some were likely breeders that were nesting in the area, probably about half of those were likely either early or failed breeders, birds who’d already raised a brood to completion, or whose nests were predated, or who never managed to attract a mate, that were dispersing from their territories to wander around and forage while they moulted. 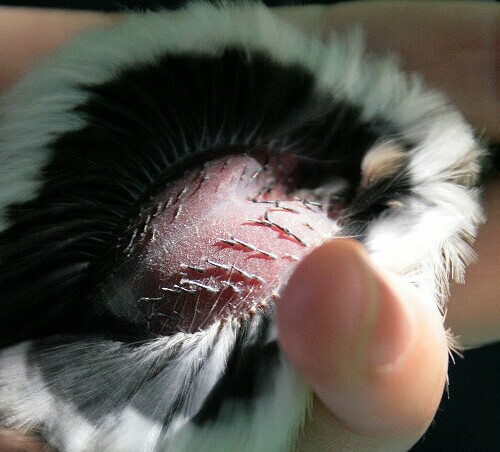 This was one such chickadee, looking scruffy as can be with half of its feathers regrowing in. It was a female, which I could tell by parting the feathers on her breast (done with a carefully aimed stream of air that makes the left and right feather tracts separate like the parting of the Red Sea). Females of most songbirds and some other species will lose the feathers on their bellies (either by naturally moulting them, or by plucking them) during the summer breeding season. This exposes a large patch of skin, which then becomes vascularized and cushioned with a thick pad of fluid. They use this to incubate the eggs, as having the eggs up against the skin is much more effective than trying to incubate through feathers. Once the breeding season is done they need to regrow those belly feathers, which is what you can see here. It’s interesting to note the colours of the feathers. 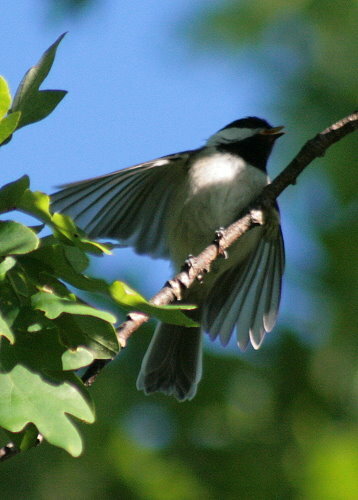 Although a chickadee’s belly is white, when you see it perched on a branch, only the outer half of the feather is actually white. The inner half is dark, and this is actually true of many birds. Darker feathers are structurally more dense because of the pigments contained in the barbs (just like how brunettes usually have thicker hair than blondes), so this offers the bird better insulation close to the body without sacrificing the visible plumage colouration. This last photo is of the same bird’s leg. You can see she’s now banded – a little circlet of aluminum that sits about her ankle like a bracelet, and slides or turns as she moves her leg. But what I was really taking a photo of was her thigh. She’s dropped all of the feathers from this thigh, exposing the skin. This is really illuminating in terms of seeing how a bird’s leg works. In our own limbs, our muscles run most of the length of our bones. A short piece of tendon joins the muscle to the bone, close to whichever bone is being moved. Your biceps, for instance, runs most of the length of your upper arm, with just short pieces of tendon near your elbow and shoulder. A bird’s leg is different. The only muscles that are used for controlling the entire leg and all of the toes are contained up near the body, in the thigh. 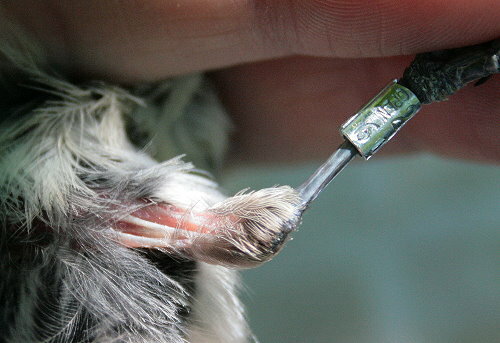 From there, long, narrow tendons run down the entire length of the bird’s leg to connect to the particular joint they need to move. This is how birds can have such tiny, thin legs, which don’t freeze in the winter. Muscles produce a lot of heat, and if you can minimize how much muscle is contained in limbs away from the body, you can minimize your heat loss. Even better, if you can do away with muscle mass away from the body, there’s virtually no heat to be lost. A minimal amount of blood travels to the legs and feet, cooled through countercurrent circulation (arteries are lined up side-by-side with veins, so that blood that’s going down to the foot transfers its heat to the blood that’s coming back up to the body, leaving little heat still in the blood to be lost to the air when it reaches the foot). Muscle is also weighty, and birds are designed to minimize the amount of weight they carry on their body (for instance, having evolved hollow bones), so by reducing the amount of muscle necessary to operate the foot they can reduce their body weight. Great post! Very informative. I’d always wondered about those bare feet and legs in the snow. very informative – I’ve forwarded link to a number of friends. thanks.